I love wicker for the warmth and texture it brings to a room. Chances are you will probably find at least one piece of wicker in every room in our home. This wicker basket belonged to my father-in-law. As a florist, he took it every morning to the flower mart to purchase his flowers for the day. It's very old and precious to me. In fact, I prefer vintage wicker, like this magazine holder with applied majolica flowers. I found this at an estate sale years ago. 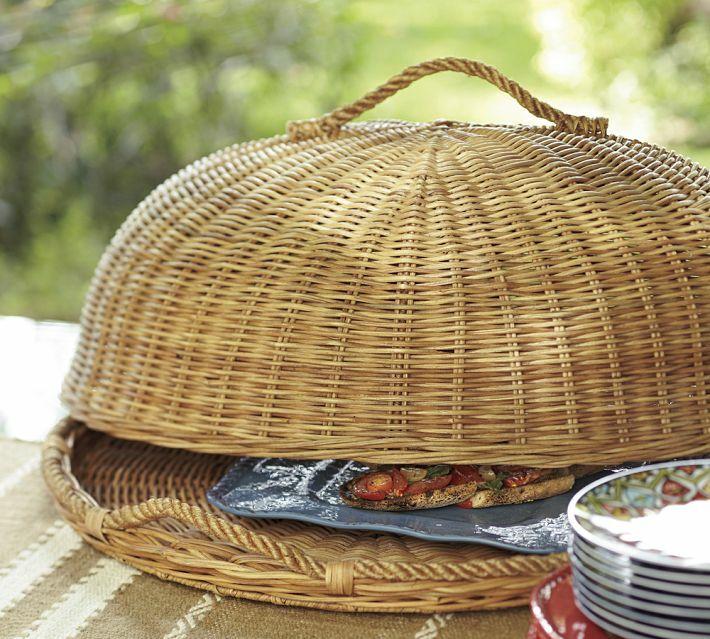 Another favorite piece is this little French picnic basket found at the flea market. A vintage wicker settee in the entry was also a flea market find. I upholstered it with grain sacks. It's a perfect place for a cat nap! In Asti, an old seagrass table serves as a bedside table. When we found this at an antique store, there was no hesitation! A vintage tiered stand was another piece I couldn't pass up! As well as this little vintage trunk. It reminded me of a similar trunk that Heather Chadduck used for her bedside. What can I say, wicker just speaks to me! In the kitchen, wicker cake stands and vintage demijohns feed my need for texture amongst all the smooth white marble and tile. 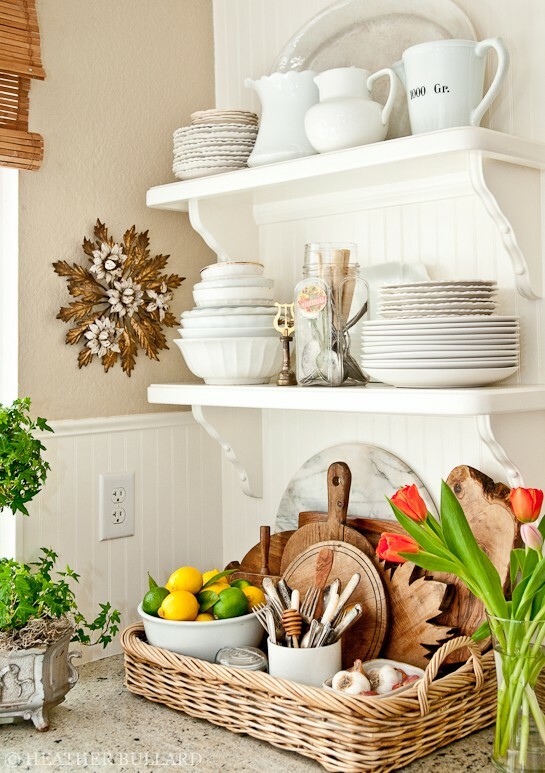 I love this kitchen vignette styled by Heather Bullard, using a simple wicker tray to corral everything together. This centerpiece wouldn't look nearly as good if the lilacs were in a clear glass container. Many of my tablescapes incorporate some kind of wicker or willow too. Grey washed willow placemats and matching barstools in Asti. The same placemat under the tent, alfresco. More alfresco tablescaping with wicker. I found these chairs at Marshalls last year. They were quite a steal, and I love how they look with the concrete table. And of course, the kooboo wicker chairs from Cost Plus gave the breakfast room a whole new look too. A wicker trunk from Williams Sonoma Home replaced the formal coffee table in the family room. It's also another great place to store stuff! Even just a touch of wicker warms up a room. Chances are if you love wicker, you also love linen, seagrass, grain sacks and burlap. They all provide texture and are the foundations and backgrounds highlighting the finer things in our rooms. See what I mean? 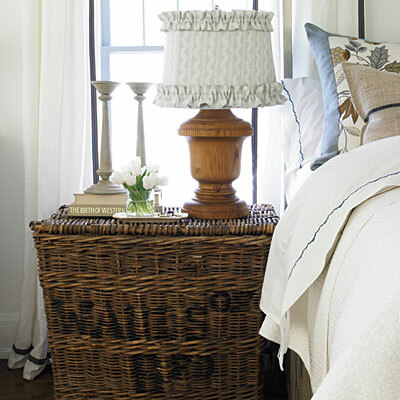 The wicker covered bottle is what makes this vignette come alive. But practically speaking, there is nothing like a warm, wonderful, woven wicker basket to hold it all together, don't you think? After which I say, "you can never have too much wicker, or too many baskets!" Look around. I'll bet you have more wicker than you think you do! How wonderful to have your father-in-laws flower basket and to imagine the flowers that were bought and sold from it, who bought them and who received them. I love the little vintage trunk with the metal latches too, willow and reed wicker is so tactile and warm. Beautiful wicker- I love it too! I do! I do have more wicker then I thought I did! You have reminded me of how beautiful it truely is! Thank you for your gorgeous pictures, I shall be on a wicker hunt from now on! So much eye candy and i agree, I too have a thing for baskets. I am always drawn to them and it is for their warmth and texture. Plus they are so versatile as you have pointed out so well in this post!! Love all of your warm, wicker touches in your home, It is raining here so I am staying in and staying dry, how about your neck of the woods? This is a great post filled with an overload of beautimous! :) Makes me want to run out and buy some more wicker. I have a few pieces here and there, but certainly not as much as you. I think your side table is my fave. And you're right, I am also drawn to burlap and grain sacks. Love. Hope you're having a great weekend. I have always loved old baskets, You have use them in a creative and beautiful manor. Thanks for sharing. I agree with you and you have a gorgeous collection and variety of wicker pieces. Some of my wicker baskets I have had forever! Plus, those I have given up, I wish I still had. I never cease to be amazed at how gorgeous your home is!! I have a question, does your cat scratch your seagrass rug? We'd like to replace one of our large rugs with seagrass or sisal but I don't know how my cat would react. That might be too much temptation to scratch. I agree, wicker makes a great accent! You've found some great pieces! I love the willow placemats! Wicker is really durable too! Your father's flower basket is wonderful- What a treausre! Nothing says Cozy, Homey, Welcome-y like beautiful old wicker. I only wish I could have given you a photo of my favourite wicker handbag for your post!! Delores, You have wonderful pieces of wicker. I have always loved the chairs with your concrete tables. Love,love this post! Your wicker pieces are speaking to me. I especially like your father-in-law's flower market basket...how wonderful to have that special piece . 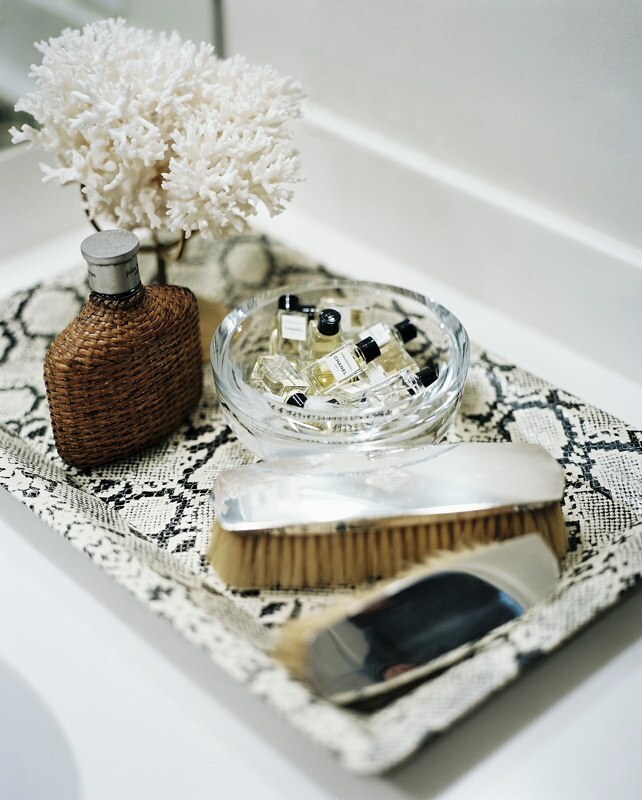 The wicker covered bottle on the "snake skin tray" is so unexpected and gorgeous. There's nothing like the patina of old wicker. FABulous vignettes. Wicker is a love of mine as well! Wonderful post! I do love all the wicker products you showed! Fabulous! I have always loved wicker too! It's the perfect natural textural complement to any room! I have some in every room of my house. Not kidding! Your pieces are stunning! Love the chairs both outside in Asti, and in your breakfast room! And I too, think burlap is it's natural companion. Have a fabulous week, Delores! Oh my gosh I loved this post...I featured your gorgeous view on my blog...and to think you got those chairs at Marshall's...you are a girl after my own heart. I love Heather Bullard's image of the wicker tray organizing the kitchen. Wicker really does add texture and character. Another beautiful post. I love wicker too and your post leaves me wanting more! 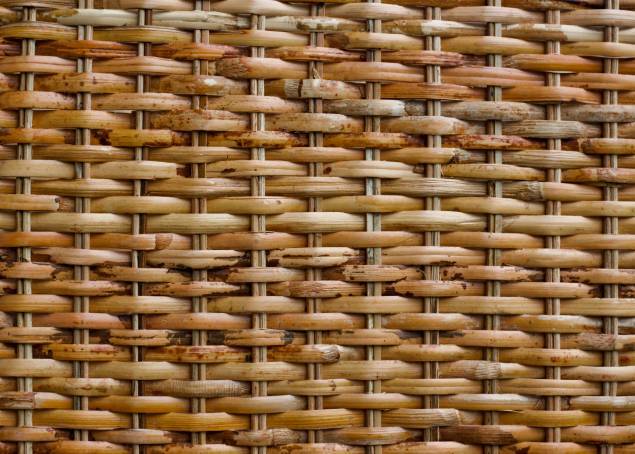 You are so right about if you love wicker, you will love most other textures. I really hope that texture is here to stay and won't be considered trendy in a few years. I love burlap! What a wonderful post. I love wicker but I especially enjoyed the beautiful images. I think my favorite was the flower basket because of the family history..I think those are the objects that really create beauty in our homes, the ones with a personal story, don't you think? I'm a new follower! Love each piece, that wicker covered bottle is just wonderful!! Beyond fantastic post, Delores!!! I am in love. Every photo takes my breath away. Love it all! 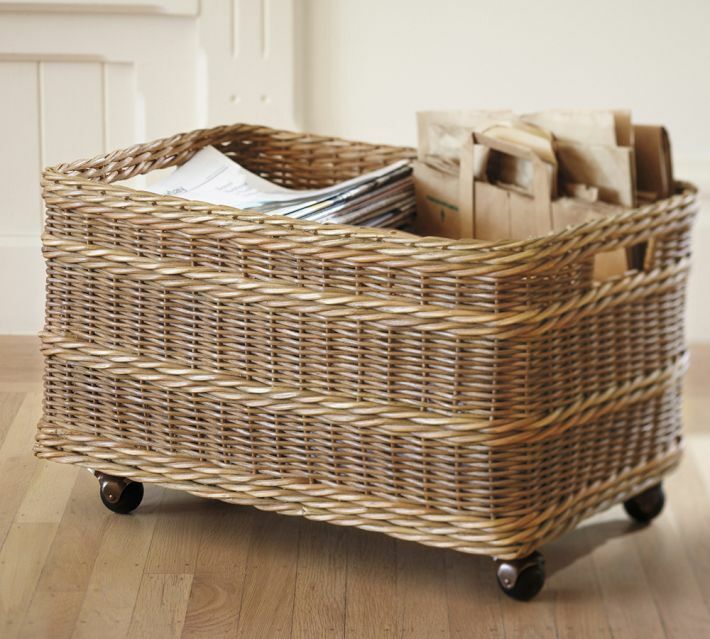 I love this post on wicker and the way you have used all aspects of this great invention! Great post. Loved it all!